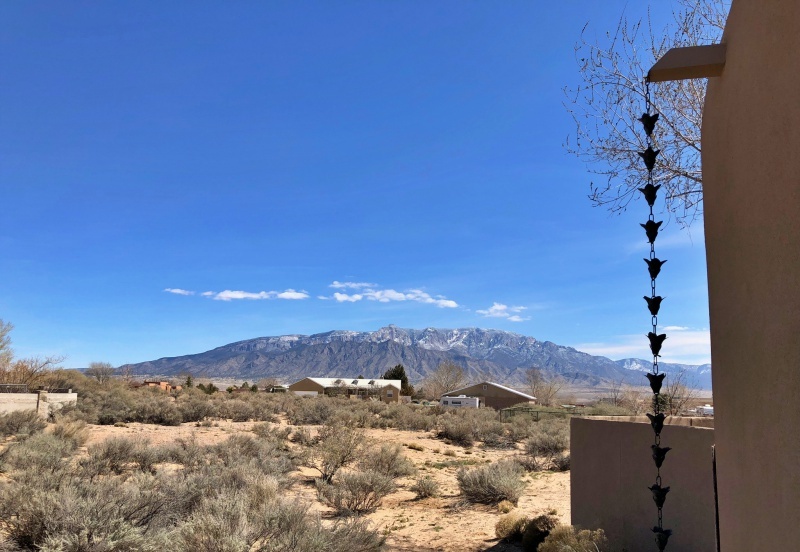 For a small, bucolic, originally agrarian community spread out along a 10-mile stretch of the Rio Grande, there is a lot going on in the Village of Corrales. The village sits on the middle Rio Grande Valley floor, it's lush silty soil a boon for the small farmers & corrals of horses that dot the valley. 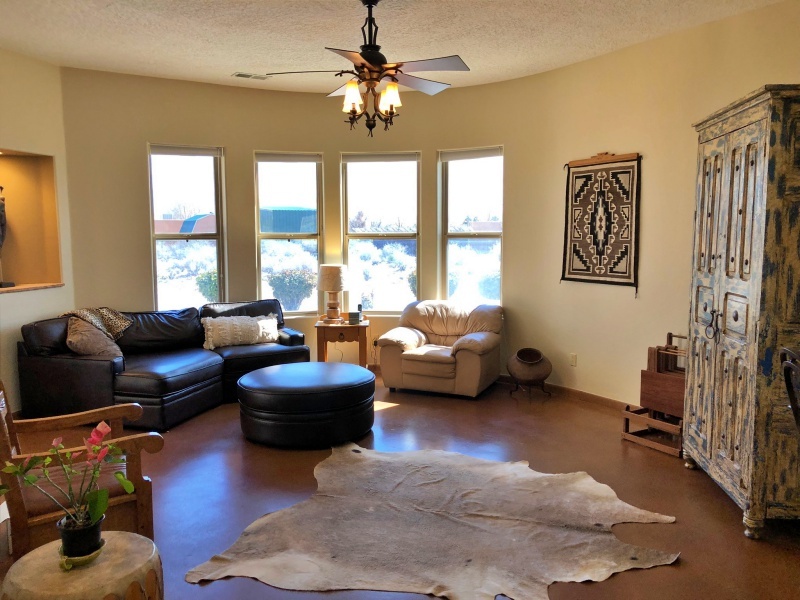 The community of over 8,500 residents is bounded immediately on three sides by the cities of Albuquerque & Rio Rancho, & is flanked by the 22,000+ acre Pueblo of Sandia across the river to the east. Combined with Bernalillo & Placitas, the South Valley, Los Lunas/Belen & the East Mountain area, this population center creates the largest human density in the state--with well over 900,000 residents: the MetroABQ. Sitting smack dab in the middle of that burgeoning megalopolis, the often sedate Village of Corrales still strives to retain it's rural character. 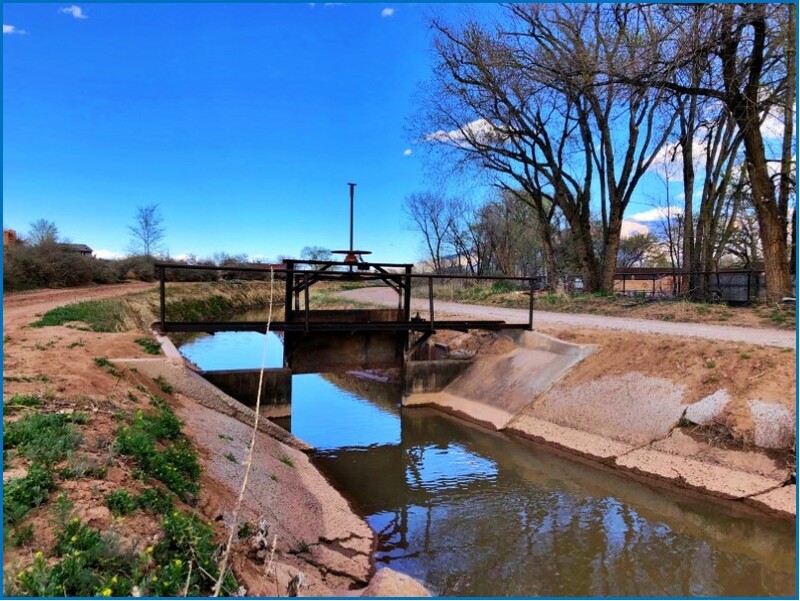 The image above & directly below are examples of that tradition--this acequia is the Main Corrales Canal, which runs the length of the town along Loma Larga Road, & provides water via dozens of turnouts serving the many private farms. Acequias are community-operated canals that carry water from the river to the fields. Originally used in Spain, the idea migrated to the modern-day Southwest, & Northern NM specifically, around 400 years ago. 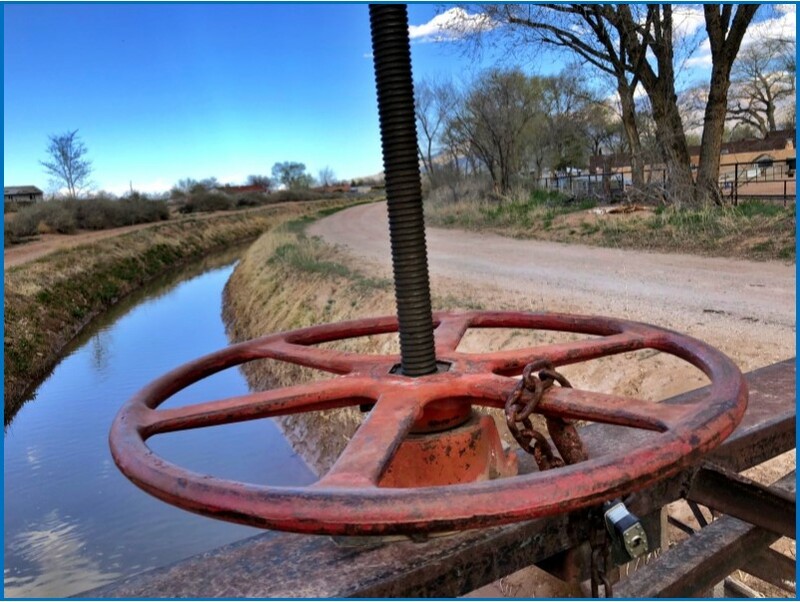 Above is a padlocked gate-lock, opened only by the acequia Mayordomo; the canal was already running in mid-March, ready to irrigate the Corrales farmlands. 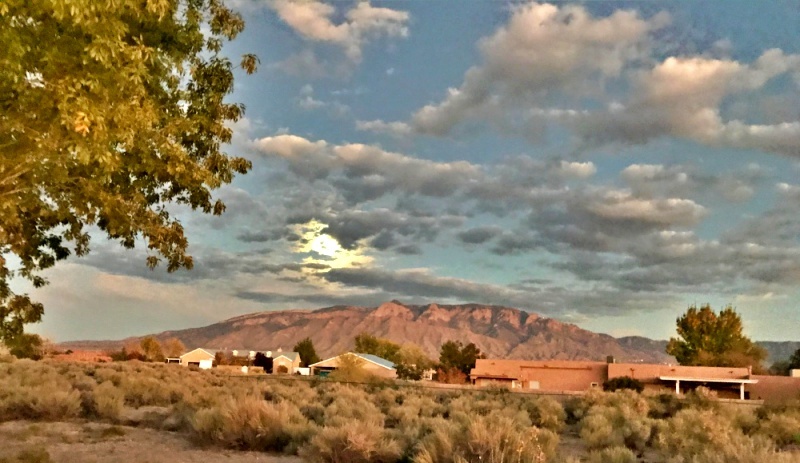 Wherever you are in the Village of Corrales, the backdrop of the Sandia Mountains is ever present & always tells you which way is east. I find myself snapping photos of the views almost non-stop when I'm there. 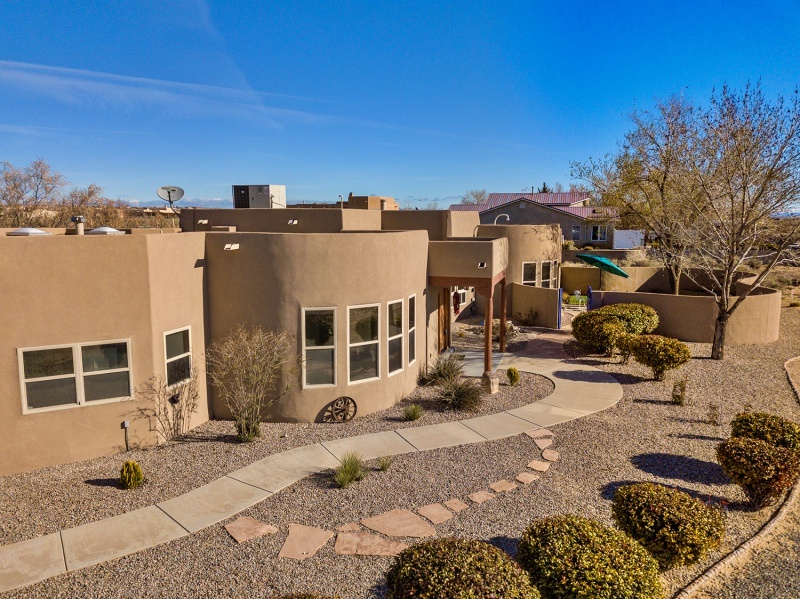 I hired a drone operator to photograph a Corrales listing from above & he included some great winter scenery views, seen directly above & below, facing due east & north northeast, respectively. What is going on in Corrales? A lot, it seems. Starting six years ago, Corrales began installing solar panels on village municipal buildings--the Senior Center, Firestation & Village Hall. The Village estimates it will have saved in excess of $30,000 at the end of 20 years from those three solar photovoltaic arrays. Since then, there are others, notably the creation of a large carport solar array over the Parks & Recreation parking area, seen above. The benefits of the carport solar array are twofold: the town gets solar power to use, & the shade created by the panels minimize the summer heat for the vehicles under them. At Silver Leaf Farms, the two brother-owners utilize solar panels to run the extensive evaporative cooling system in their Corrales greenhouses. 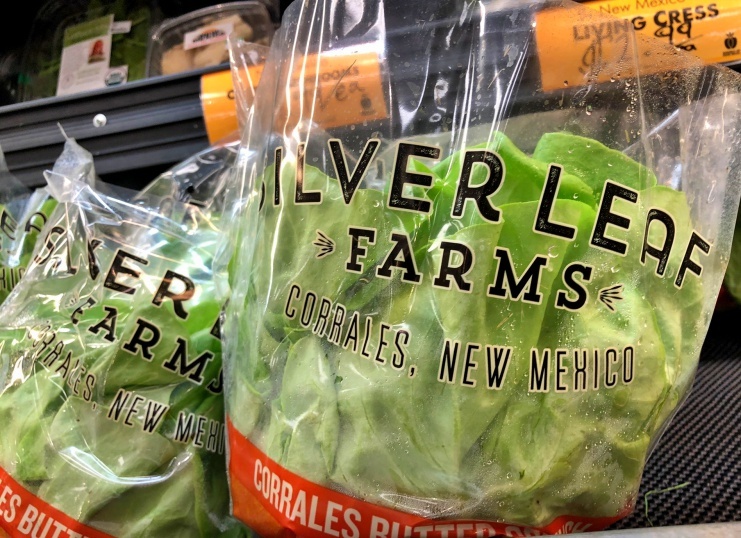 This enables their produce to be grown year-round; immediately below is their butter lettuce seen in March, found at La Montañita Coop. 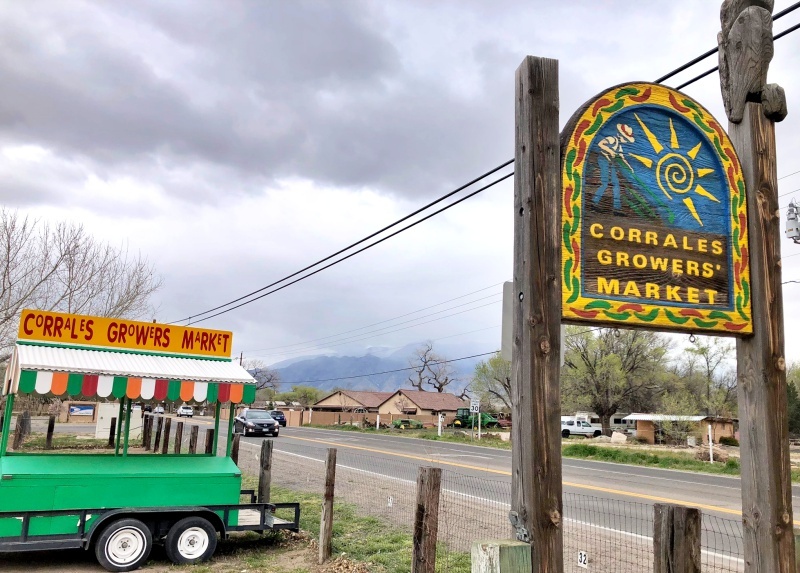 Or you can buy their produce within walking distance from where they were picked, at the Corrales Growers' Market, which basically runs year-round--Winter Market ends April 7, when the space transitions from monthly to weekly, starting April 28th. Most of the MetroABQ Growers' Markets also start in April. 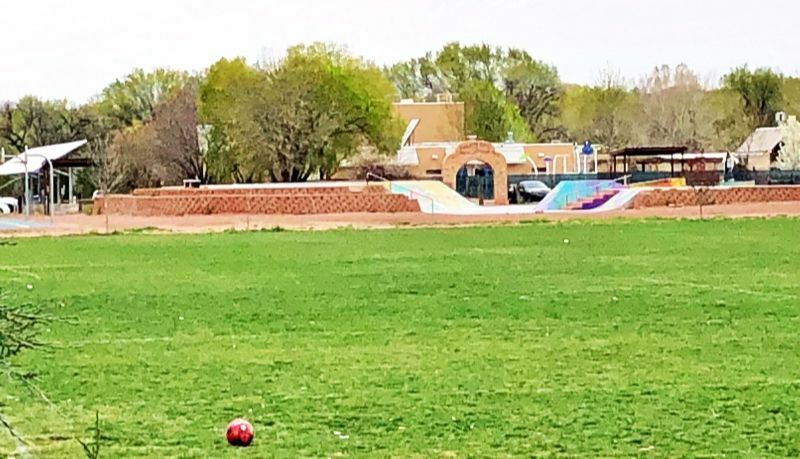 Greenspaces & parks abound: adjacent to the Growers' Market are the Corrales Soccer fields, which is connected to the skatepark & more fields behind that at the Corrales Parks & Recreation Center. Plus, there are about two dozen bike trails & cycling courses scattered throughout the village, along with walking paths & horse trails, wending along the arroyos & acequias toward the mesa or the river. The vast majority of the approx. 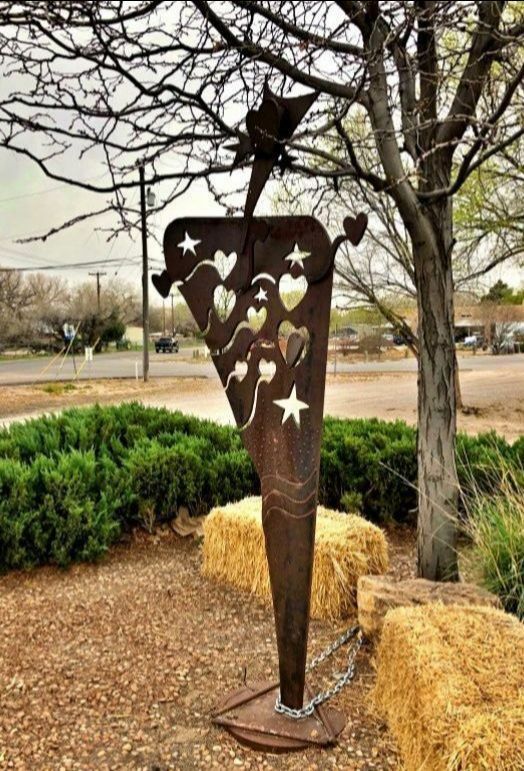 250 businesses in the village are located along the main thoroughfare of Corrales Road, & with good reason: The ten-mile stretch of that road--from Alameda on the south & up to the Rio Rancho community of River's Edge to the north--is designated one of America's Scenic Highways by the National Parks Service. A Scenic Byway-designated road is based on one or more of these inherent qualities: architectural, cultural, historic, recreational or scenic importance. The Corrales Road Scenic Byway embodies all of these qualities. From New Mexico True: The sounds of birds in the bosque & water in the acequia; the earthy smells of livestock & tilled earth, & roasting green chile in the fall; the lush greenness of the best remaining example of a middle Rio Grande cottonwood forest. The Bosque's 400 acres along ten miles of the river provide habitat for over 180 species of migrating & nesting birds, making Corrales a destination for bird watching. Directly above is an adobe wall along Corrales Road with a hand-made metal cross, sporting a skull lain on top. 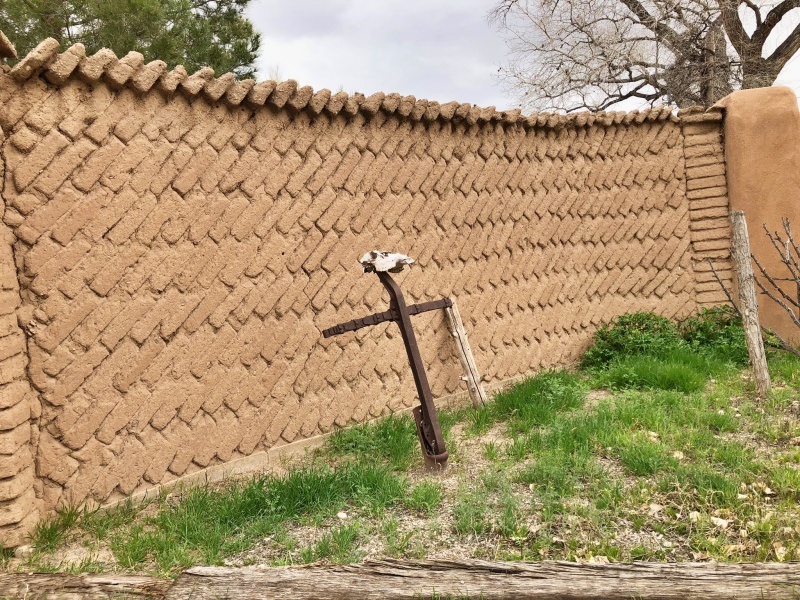 Made of earth mixed with water & often with organic material such as straw (or dung), adobe blocks are used liberally throughout New Mexico, & often with relish by Corraleños. Adobe blocks are usually set level/flat to form the wall; however, the blocks in the wall above are set in a diagonal formation--even the wall cap blocks lay at an angle--drawing the eye toward the scene from across the street. 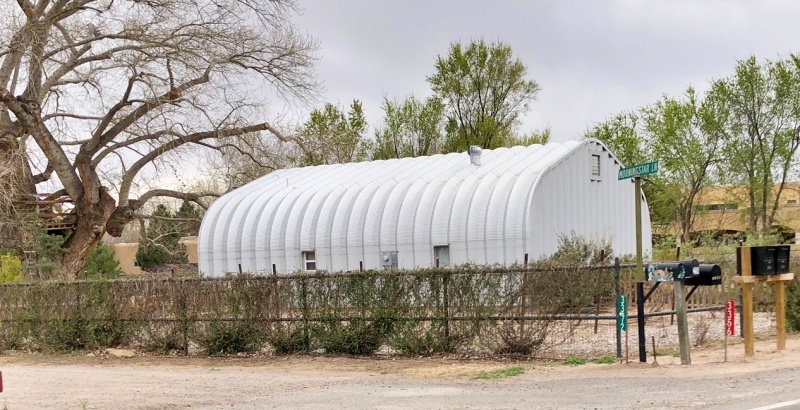 Further on up the road, other interesting scenes line the scenic byway, like the undulating steel barn scene, above, or the cut steel sculpture outside Frontier Mart, one of over 40 galleries in town. 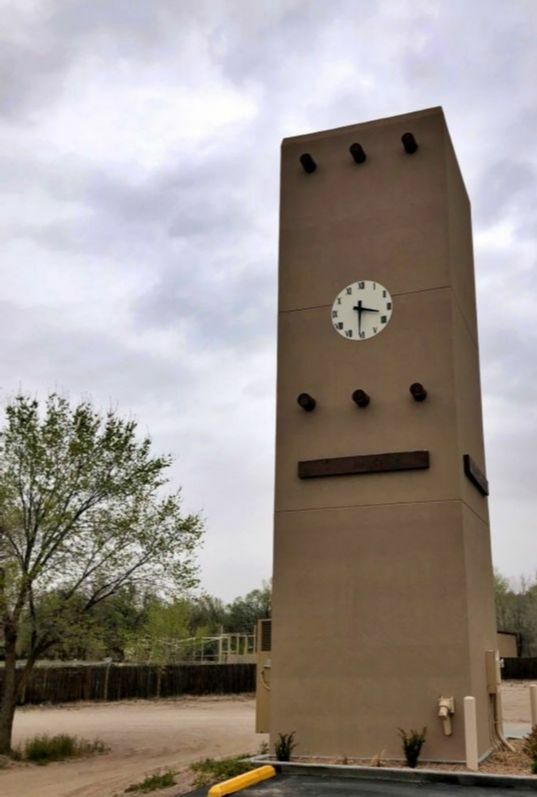 A town clock, above, was crafted in a Pueblo Revival style, & has the requisite extruding viga beams & (faux) lintels, which are the exposed beams usually only over windows & doors. 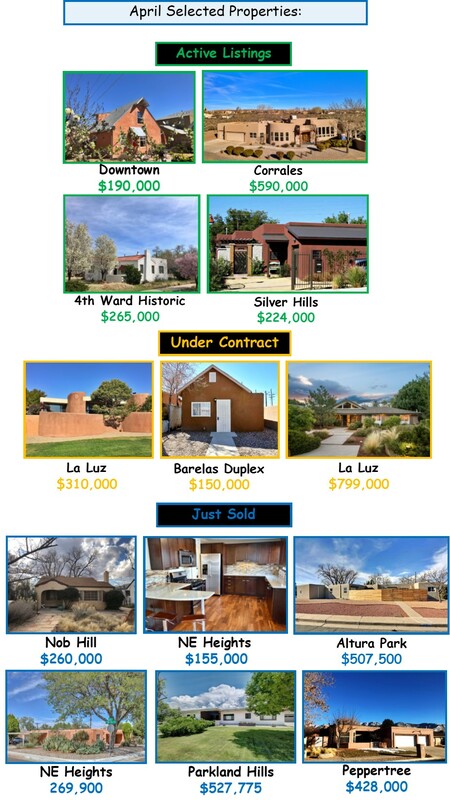 Spanish Pueblo Revival is a very popular style in Corrales. Corrales is home to numerous festivals & other public events, like the annual Corrales Wine & Cheese Pairing at three wineries that runs for two days April 6-7th; Corrales Historical Society occupies & continuously restores the historic 1868 Old San Ysidro Church with regular events; the Corrales MainStreet Chili Challenge was last month; there's the monthly Music In Corrales series; the Growers Market Harvest Festival, etc. As mentioned earlier, my friend Dan, an FAA certified commercial drone operator & NM Tourism Dept's Video Services Manager, photographed (drone-agraphed) my listing on Camino de la Tierra, west of the Loma Larga acequia. The 3rd & 4th images from the top & the image below are from that drone photoshoot. Dan was a great sport--during the session he lent the remote controller to the owner, who navigated the drone seamlessly, (amazingly) avoiding all solid objects in the way. 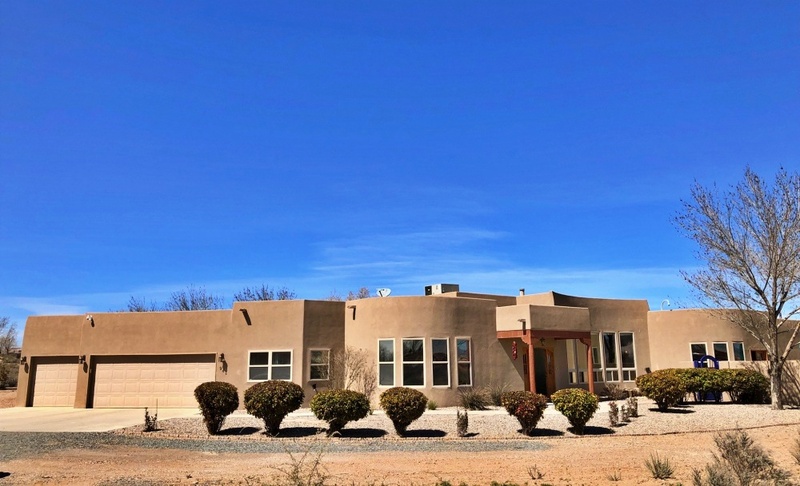 Impeccable 14yo contemporary single-story, 3730sqft Pueblo Revival five bedroom/four bath home at the end of a sweet cul-de-sac & with stunning Sandia & Bosque views. 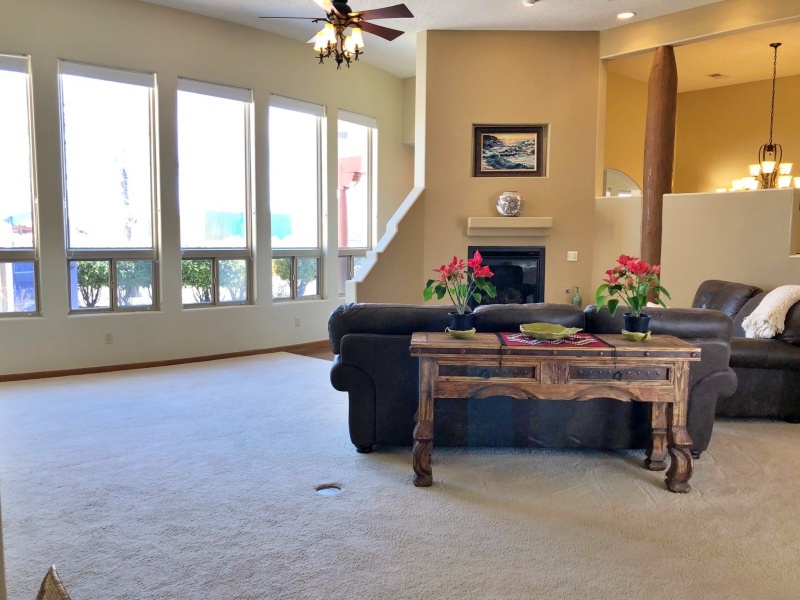 Fabulous Master opens to it's own private courtyard with more amazing mountain views. 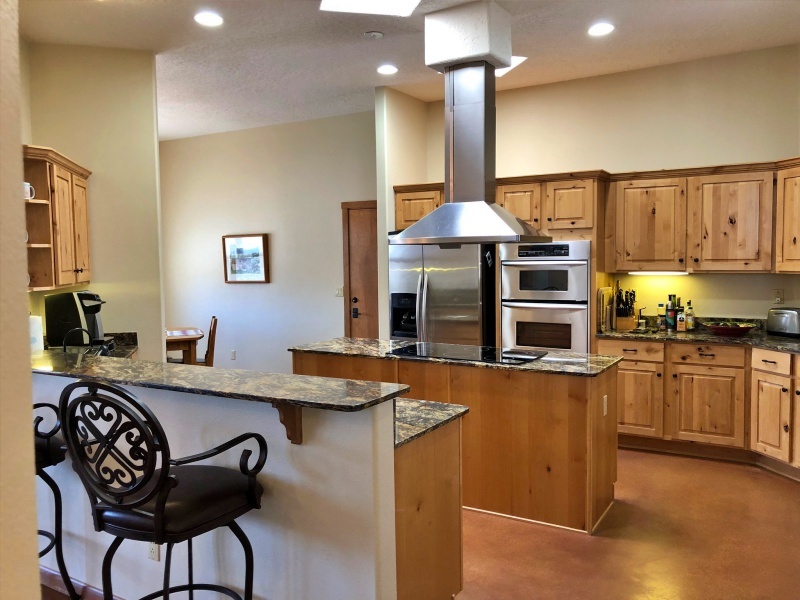 Includes an office/guest bedroom with en suite & private entry, & a large Chef's kitchen with granite, stainless, an island centerpiece & a separate breakfast nook. Some green touches include stained concrete radiant flooring & efficient LED lighting throughout, + hearty high desert grass & smart low-water landscaping. 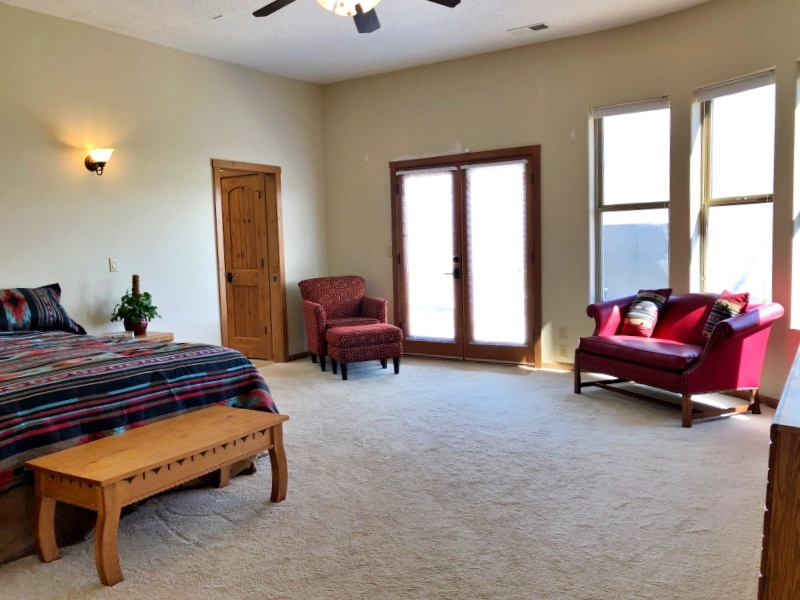 More to love: 12' living-&-dining room ceilings, vertical viga columns, sandstone nichos, corbels, a grande Kiva fireplace, 'wavelength' curved wall of windows,& a serene backyard covered patio chillspace. View the 3-D Walking Tour for the home. From Loma Larga & Meadowlark Lane, head north 3 miles to Camino de la Tierra, which will be on your left/west. On the north side of the road around the 9th block west, you'll see a cul-de-sac to your right. 941 Camino de la Tierra sits at the end of the four-lot gravel lane. There is plenty of parking in front of the home; it also includes three parking bays behind two garage doors. in the greater MetroABQ area. See more 3-D Walking Tours!